Argentina is almost 3,700 km long from north to south, and 1,400 km from east to west (maximum values). 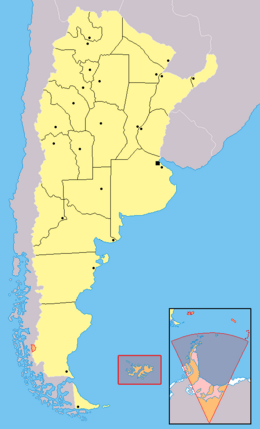 It can be divided into three parts: the Pampas in the central part of the country, Patagonia in the southern part down to Tierra del Fuego; and the Andes mountain range along the western border with Chile, with the highest point located in the province of Mendoza. Cerro Aconcagua, at 6,960 metres (22,834 ft), is the Americas' highest mountain. The most important rivers include the River Plate, Paraguay, Bermejo, Colorado, Uruguay and the largest river, the Paraná. Geography of Argentina Facts for Kids. Kiddle Encyclopedia.